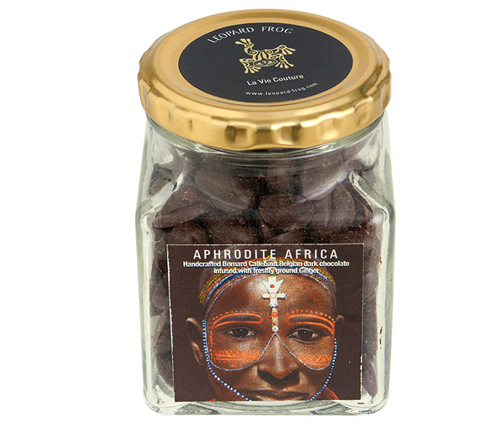 Aphrodite Africa combines Bernard Callebaut Belgian dark chocolate with ginger and other secret ingredients into bean shaped chocolates that deliver a Zen-like chocolate experience. Mouth-watering dark chocolate with freshly ground ginger that deliver a Zen-like chocolate experience satisfying to the mind, body and soul. Man cannot live on chocolate alone, but woman can. Dark couverture chocolate (>56.8% cocoa), cocoa mass, cocoa butter, emulsifier, soya lecithin and ground ginger.